It’s a nightmare that haunts every parent: What would happen if you died while your children were very young? The fate of their friend of 25 years shakes the two women when they think about Kendra’s plight. Amanda dabs at her eyes and sits quietly for a moment or two. “It’s just so unfair,” she says. Kendra’s life is slowly but surely being stolen from her by a rare and fatal cancer and there is nothing anyone can do to stop that. The only thing Amanda and Kathy can do is raise the money needed to help Kendra create some very bright memories for her young daughters. Towards that end they approached Tanya Secord for help in organizing a fund-raising event here in Revelstoke. Born in Salmon Arm and raised in Revelstoke, Kendra Wiberg (nee Brown) graduated from RSS and studied environmental science at Simon Fraser University. Like all young people she wanted a meaningful career, which she found with ALS Canada, a firm that offers laboratory testing. She eventually became branch manager of the company’s mineral testing lab in Kamloops. Though she lives there now, she still has family here, including her sister Rhonda Schmidt and her grandmother Maxine Brown. her parents now reside in Fort St. James. Life seemed good until, in 2001, she was diagnosed with a rare dysgerminoma ovarian cancer in 2001. This type of cancer is seen in less than 1% of all ovarian cancers. She underwent surgery and her left ovary was removed. That seemed to be that and Kendra went on to meet and, in 2008, marry LarryWiberg, who works with the Rocky Mountaineer. Daughters Madison and Sierra were born five and three years ago, respectively. A great career, a loving husband and two beautiful daughters; life was unfolding as it should until August 2012 when, concerned about an increasing sense of fatigue and abdominal troubles, she sought medical assistance. “Despite a few uneventful trips to the doctor she wasn’t diagnosed for months to come,” says a post on her Facebook page. In early September Kendra could feel an extremely large mass in her abdomen and immediately went to the ER. “The ER team at Royal Inland confirmed large masses on her right ovary, omentum and kidney. Unfortunately, over the next month a diagnosis was still not reached. Kendra’s condition deteriorated rapidly and she spent most of the month in bed or in hospital. The BC Cancer Agency finally decided that a surgical gynecological team in Vancouver should operate for what was likely an ovarian cancer. At the time of surgery, a complete hysterectomy, oopherectomy, omenectomy and appendectomy were performed. The cancer was also on her diaphragm, large and small intestines and entire abdominal cavity. 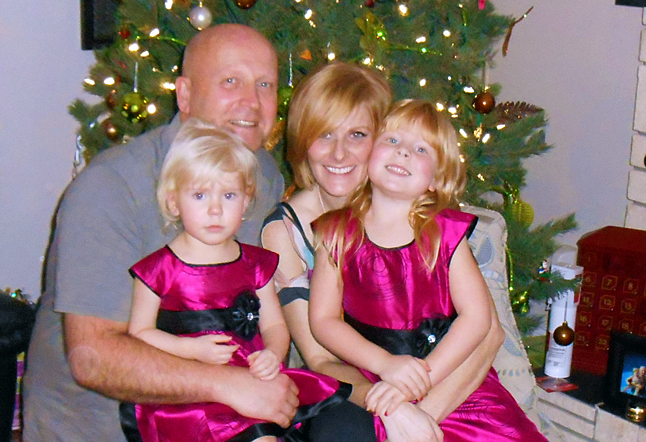 “Two weeks later we received the diagnosis: mucinous adenocarcinoma appendiceal cancer. So rare the chances of getting it are 0.12 in a million. “Follow up biopsies also concluded that a separate non-related kidney cancer was present. “Kendra was scheduled for a debulking surgery complete with HIPEC (Heated Intraperitoneal Chemotherapy). Unfortunately, by the time the surgery was performed there was so many tumors in the small intestine, the surgery became palliative rather than curative. “She’s trying to create happy memories for her family,” Amanda said. 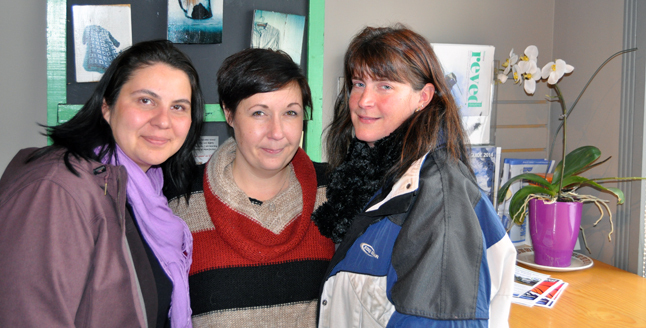 Amanda, Kathy and Tanya have organized a fund-raising event at Cooper’s for February 21. From 10 am until 6 pm her friends will be offering a barbeque and a prize wheel raffle. Please click here to view the poster for this event. Another friend, Jo-Ann Lewichew-Fox, has set up a crowd-sourcing page for Kendra. Please click here to visit that site. Donation boxes have also been set up at Pharmasave, People’s Drugmart, the Nomad, Carrie’s Cafe, Malone’s and Revelstoke Florist. There’s a lot going on and it’s a testimonial to the friendship that binds all of these women together. “Our goal ius to help make what time she has left as easy and bearable as possible,” Tanya said.